Electric power - and other things that go bump in the night! 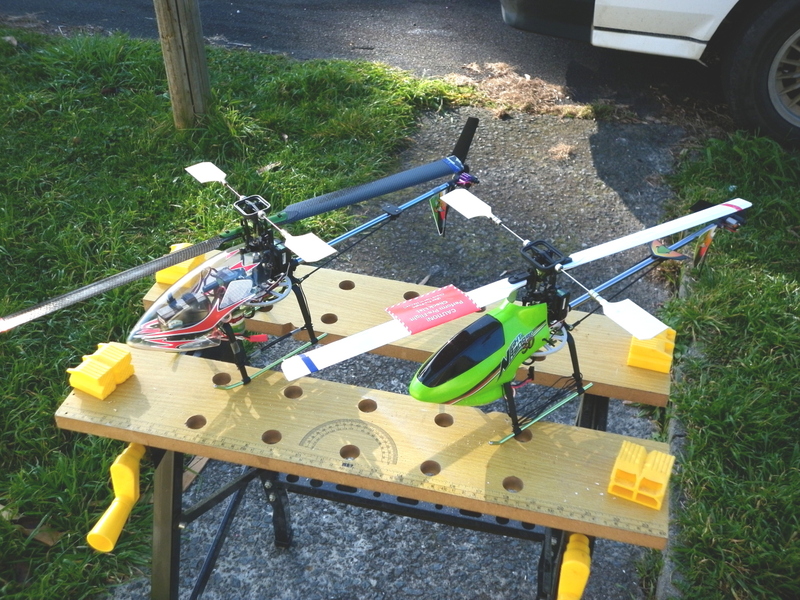 The electric powered helicopters I bought have arrived and my first tentative steps into heli flying have started. Tentative is right! A lack of familiarity with electrics as well as RC Helicopters proved my undoing in the first ten minutes. The first discovery I made is that the power curve of an electric motor is not similar to that of an IC engine. The first inclination I had of this was when I transitioned from idle and suddenly I had a model heading 50 feet in a sideways direction at about 3 foot altitude. Um - throttle back to idle and the bloody thing kept going. Luckily there was a convenient soft bush in the way and there was no major damage other than to my pride, after all I was a full sized heli pilot with over 3,000 hours on 3 types! Yep - before you point the accusing finger I KNOW that full sized experience does not mean a zot when learning to fly RC - either fixed wing or Heli. So - back to the drawing board so to speak and humble acknowledgement of Mick's first law of RC flying - READ THE BLOODY MANUAL!!! OKKKKK said me - I didn't set up the transmitter properly - and errr - a few other things as well - technical little brutes aren't they?? So we read the manual - in detail - twice - and finally satisfy ourselves everything is right this time - I even fitted one of those trainer undercarriage things with plastic balls on the end. Once more unto the breach dear friends! OK - the book says to start off by learning to hover - yep - should be able to do that - gradually bring throttle up to about 60% and the thing starts to look very light and some what frisky - OK - a bit more and - damn to much! Suddenly have model at about 50 feet. Don't panic - gradually reduce throttle in small increments until - DAMN - it drops like a stone.. Amused colleague who is observing and flies 60 powered IC 3D monster falls over laughing. Overcome urge to beat colleague to a screaming pulp and pick up model which has landed - well, arrived, on the earth - about 200 feet away. Nothing snapped, twisted or broken on model but pride is suffering a terminal meltdown. The best thing to do when you fall of a horse is to get straight back on the bloody thing so - change Lipo battery just to be on safe side and back to hovering - I hope. Hmmm - better this time - go it to hover at about 3 feet - increase throttle VERYYY GRADUALLY and little monster rises to about 10 foot. BIG GRIN! back throttle back a bit and it begins to sink - throttle up one click and it settles to the original height - Hmmm this isn't so hard so I'll try to rotate left about a - HEYYY - not three complete revolutions! I'll correct that, I'll - model stands on it's head - twists viciously to right and is suddenly at about 100 feet - and upside down! - well it is supposed to be a 3D capable model - colleague in background is having convulsions and threatening to wet himself with laughter. I'm completely lost and haven't a clue what to do so I throttle back to idle. Model plummets to ground like a stone. For once Mr Murphy and his rules are on holiday and the model lands/crashes into some tall grass. A bit of damage but only superficial. I start to mutter about bloody electrics, bloody ARFs and grumble to myself about arranging a funeral complete with bonfire. As a precaution we change the rotor blades because one has a large chunk out of it and then observer colleague takes the thing up and does all sorts of twisty wiggly things without effort. My pride has deserted me and gone home on it's own. Since that first debacle I have been practicing with the model at every opportunity - I can now hover and rotate left and right without to much trouble - sort of. Once I feel I have that sorted out I will try to master forward and backwards flight and then a box pattern both with the model facing me and facing away. Stay tuned for the next installment of what it feels like to be a beginner after more than 30 years of fixed wing RC flying. The offending item is on the right! I'm yet to let the other one offend - it's modified and has higher performance.